Fresh from Philippe Coutinho’s transfer request and another disappointing summer in the transfer market despite gaining Champions League qualification, Liverpool looked like taking another two steps back after their one step forward in 2016/17. Nevertheless, they had the perfect opportunity to assuage fears on the pitch, with an opponent in Watford who narrowly missed out on relegation last season, collapsing drastically after a strong start. Marco Silva sent out his new team in a 4-2-3-1, while Jurgen Klopp continued with the 4-3-3 used for much of last season, with Sadio Mane switching to the left as Mohamed Salah made his debut on the right. The match started much as you would expect: Liverpool in possession of the ball while Watford sit back in two banks of four, although often opting to press if given the opportunity, forcing the ball back to Simon Mignolet to punt long. Watford moved the ball quickly, using the pace of their wide players and Stefano Okaka’s hold-up play to counter. Then, like clockwork, Liverpool conceded from a set-piece. If you ever get the opportunity to claim free bets without depositing, put it on Liverpool to concede at a set-piece. Put your house on it. As night follows day, an opposition corner leads to Liverpool players trudging towards the centre circle. Zonal marking was immediately blamed despite the fact that Liverpool use mixed marking yet, despite clear systemic flaws, Liverpool’s ineptitude goes far beyond that. Watch the replay and every single man marker has lost their man by the time the kick is taken. Every single one. Even more egregious is that no one even jumps: with every set-piece they stand flat-footed, lucky to have taken a step before the ball hits the back of the net, and yet have the nerve to appear shocked that it’s happened again. It’s a common refrain from pundits that any poor organisation is embarrassing as a professional but this truly is: you can quite easily coach teenagers to stay on their toes and attack the ball. Given this has been going on for years now and they have regressed to defending worse than literal children, you have to wonder what it is they work on in training. On top of their abysmal acknowledgement of the basics of defending, you have to question their set-up too: why is Roberto Firmino standing in the centre along the six yard box? This is the most dangerous area and typically taken by a team’s strongest headers of the ball, so why is the lightweight 5ft 11 attacker positioned there? Rather than sit back and defend their lead, Watford were emboldened by their opener, attacking down the wings with quick one-touch passing and the full-backs rushing forward in support of their wingers to double up on Alberto Moreno and Trent Alexander-Arnold. The focus was mainly down the right, especially from long balls where Okaka would move across into the channel to knock it down. Presumably this was to target Moreno, who actually had a reasonable game, but Dejan Lovren struggled to cope. The Croat is a very aggressive defender which can can make him useful in Klopp’s system however his decision-making is awful – he will often try to claim balls he isn’t able to reach, and as a result it’s pretty easy to catch him out high up the field or turn him. Liverpool didn’t really grow in attack either. Jordan Henderson was being blocked off by Okaka and Tom Cleverley so he had to come very deep in line with the centre-backs to collect the ball, while both Emre Can and Georginio Wijnaldum are poor at providing an option for the defenders to play out. Although they usually improve as the ball heads into the final third, they weren’t very helpful against Watford, often standing static along an already crowded attacking line. Them playing so far forward also caused issues when Watford won the ball back, as it left a huge gap between the defence and forward line for Henderson to cover, making it near impossible to counter-press. Nathaniel Chalobah and Abdoulaye Doucoure did a good job of shielding the defence, ensuring Firmino was crowded out. On the right, Salah was attempting to dart in behind, not really looking match sharp and cut out of the build-up, leaving the left wing to make up for the creative shortfall. 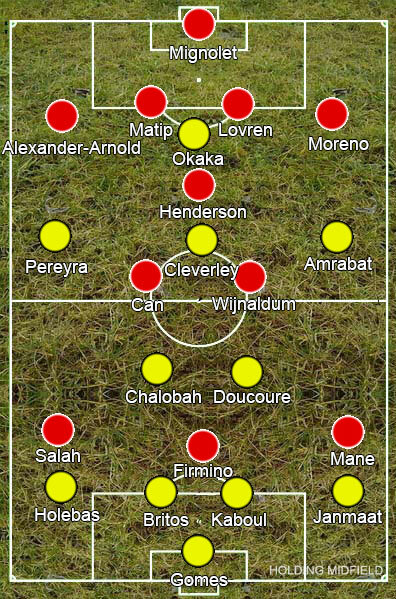 Mane typically played in a role more similar to Salah’s last season, so the Egyptian taking up those duties gifted the Senegalese more opportunity to drift around, pick up the ball in nooks and crannies and make use of his dribbling ability, while Moreno got up and down the left flank to keep Watford stretched. Can laid the ball off well, however Liverpool’s equalising goal was entirely down to Mane’s quality: driving across from the right then twisting Watford’s midfielders a second time, before running from deep, having the intelligence to dummy Moreno’s pass and finishing calmly. It didn’t take Watford long to retake the lead. Moreno’s challenge was weak and him going to ground left big gaps, but the midfielders ahead of him were also culpable, failing to stay compact and slow to pick up on the danger. Wijnaldum and Doucoure were like chalk and cheese: the latter jumping at the opportunity to play in Cleverley and snatching at the rebound as the former never got near. Liverpool came out for the second half even poorer than before, misplacing several easy passes, but Watford looked more settled in their lead now, letting Liverpool have possession. This backfired quickly as Salah won a penalty. Joel Matip was left alone on the ball with no attempt to close him down, giving him all the time in the world to slide through a pass to Firmino, who slipped a pass in behind for Salah to run onto with one touch, brought down by Gomes as he rounded him. The goal demonstrated the effect that Can and Wijnaldum could have as Chalobah and Doucoure were occupied trying to stop the ball being played into them, opening up space for Firmino to dart into – the plodding Younes Kaboul never having any hope of catching up with him. Failure to put any pressure on the ball backfired again minutes later, as Lovren sent a ball straight over the top for Firmino to run onto. His dink was presumably intended as a shot but Salah was on hand to bundle it over the line for a debut goal. With the lead, Can and Wijnaldum were more conservative in their positioning. The centre midfielders rarely joining the forward line made it far easier for Liverpool to stamp out counter-attacks, so, despite Watford going back to the same strategy of rapid passing focussed on the flanks, it wasn’t nearly as effective as in the first half. Liverpool had rarely had a proper grip on the game, but Watford lying back after half-time had gifted the defenders time to pick out a freer Firmino. It looked like they would escape Vicarage Road with three points in spite of their poor performance. Then Watford won a corner.